It was the second time that I used something other than water to mix the lye in. 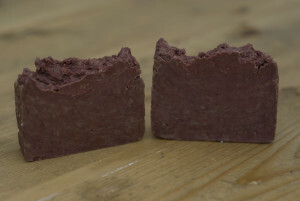 I had heated up some Mulled Wine to reduce it down to a thicker syrup and evaporate some of the alcohol away – alcahol can cause some issues during the soap making process. I added water to the wine syrup to give me the total amount of water that I needed for the batch, cooled it down in the freezer and then slowly added my lye. Adding lye to wine or beer (or many non-water liquids) can create a lot more heat than with plain water. It can be dangerous if you add the lye too fast, so taking your time is key. Even though I added my lye slowly, there was no way that I could avoid the smell! The solution turned brown and really did smell bad. So much so that I worried about how the final soap would end up. During the cooking stage, the smell grew fainter and fainter. Then when I added the colour and scent in, it really came together nicely. The scent is very clearly Christmas Spice, with tones of clove and cinnamon giving it a festive flavour. In use, it was a lovely soap with a lot of lather – it was, however, a touch too much colour as it turned the water a light shade of red. In all, a lovely seasonal soap which I will be making again, albeit with less colourant.